Take Me Anywhere Suitcase Pillow Is Easy To Travel With | OhGizmo! By Andrew Liszewski on 02/18/09 • Leave a comment! There’s no doubt about it, those ‘pillows’ they distribute on airplanes during long flights just don’t cut it if you’re in the need for some serious sleep recovery. I’m pretty sure the bags of peanuts they hand out (or used to) have more stuffing in them, so that’s why you need to start bringing your own. 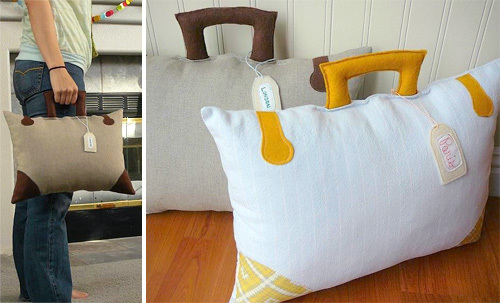 And what could be easier to travel with than this Take Me Anywhere suitcase pillow made by Etsy seller Olive. It comes complete with a carrying handle and a luggage tag that can be custom stitched with any destination at no additional charge. Sure, it would probably count as one of your carry-on items and sure, at $40 it’s an expensive alternative to something the airlines hand out for free, but anything that makes economy class more enjoyable is worth it in my opinion.